Last week Southern Rail staff went on strike, leaving thousands of commuters facing a slightly improved service. 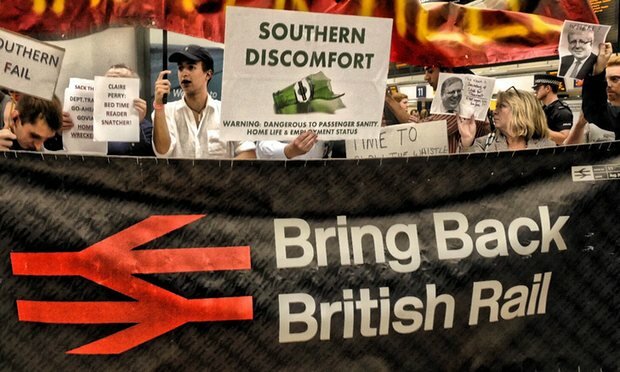 Southern’s non-stop calamities this summer have added support to the idea of renationalisation. This debate is something I watched with great interest. I’m a standup comedian who can’t drive. I have never learned. I don’t trust my hand-eye coordination. You’re looking at someone who once dropped a cricket ball on to his own head during a routine catching practice; I don’t think it’s a great idea to have me in control of a high-speed metal death robot. So I rely on the train system in this country. And I can tell you from firsthand experience that our train system is a mess. Carriages are full of unhappy travellers packed together like sardines, who have inexplicably paid for the privilege of being incarcerated. Periodically, everyone has to flee for cover, either by lying across the laps of the passengers lucky enough to have a seat, or by climbing into the luggage racks on the ceiling to allow the optimistically named “buffet” cart to pass through just in case anyone wants to spend £50 on a packet of crisps or a single fruit pastille. And it’s not cheap, either. Train fares have increased way out step with inflation, meaning the percentage of our salaries we spend on train fares is now six times higher than many of our European counterparts – and that’s if you plan ahead. If you want to travel from London to Manchester, and have not booked a ticket, be prepared to sell a kidney or stay at home. Frequent train travellers have to plan ahead, booking months in advance to avoid massive fares. But there is still the risk that you will turn up on the day and the train will have lost its seat reservations for no apparent reason, and you will end up wedged between the door and the bathroom. Other than a music festival, a train is the only thing you might have to buy a ticket for and still end up spending an hour standing next to a toilet. I feel sorry for the commuters affected by the Southern Rail chaos, especially because I hail from Croydon and have experienced that mayhem firsthand. As if being from Croydon wasn’t bad enough. When I was growing up, and periodically going to India to visit my grandmother, my classmates would often ask me about the trains. There was an exotic fascination with people sitting on top of the carriages. Well, just to clear this up, British trains are now worse than Indian trains. Even if you’re sat on the roof, at least you get a seat. But there has been a change in public opinion, if not in government policy. A 2015 poll revealed nearly 60% of us support public ownership of the railways. Last year, the East Coast service was reprivatised. The government had taken over the running of the line after the collapse of the previous private ownership and, in public control, it had become profitable to the Treasury and reported positive customer satisfaction. It is now run by Virgin Trains and, on Friday morning, staff announced strike action over two weekends in August. This means that I can’t get back to London from the Edinburgh Fringe. Once again, comedians are punished. Truly we are the most oppressed people in society. Frustration with the trains is inevitable, given the daily difficulties commuters face. In France, a near fully publicly owned rail system managed to give its passengers fares far lower than the UK for almost exactly the same amount of public rail subsidy between 1996 and 2010. Furthermore, the French government has invested profits in private rail companies, which then invest in companies that run British trains. Including – surprise! – Southern. As we haemorrhage money, we are lining the pockets of Riche Oncle Sacs d’Argent. Nationalisation might seem like the preserve of old-fashioned, duffel-coat-wearing, Red-Flag-singing socialists, but it also appears to be economically efficient. Labour adoped renationalisation as a policy at its 2015 autumn conference, and Jeremy Corbyn is trying to make this a key platform in his plans to be the next prime minister. Corbyn might be on to a winner here. Time will tell. Anyway, I had better head off – I’ve got to start booking some train tickets for October 2025. Written by Nish for The Guardian on Sunday, August 14th, 2016.